To see photos from Ahmed and Ansari’s trip, visit the gallery pages on this website. 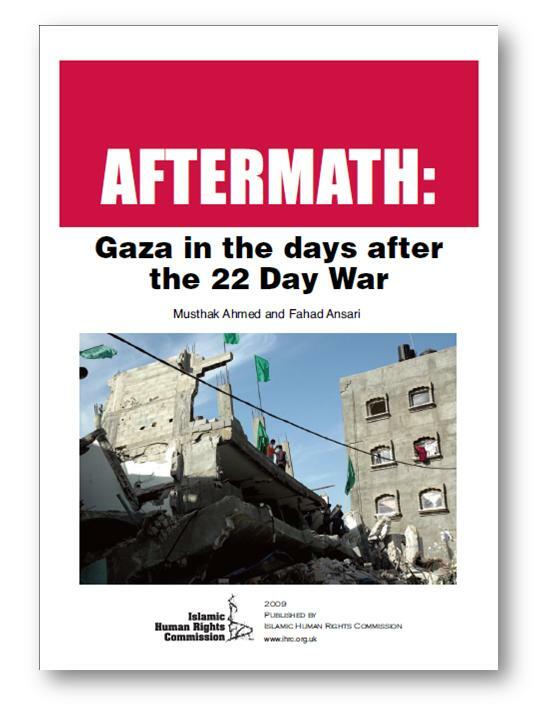 “In the light of Israel ‘s banning journalists from Gaza , Musthak Ahmed and Fahad Ansari’s first-hand account, on behalf of the Islamic Human Rights Commission, of what had happened there is informative and valuable. Their report introduces us to some of the Palestinians whose suffering we first heard about through the filter of a censored media. What the media ultimately told us of Israeli targeting of hospitals, ambulances, schools, mosques, parks is here confirmed and enlarged on. Ahmed and Ansari describe not only the slaughter but the blatant and obscene racism even in graffiti. They also report Gazans’ desire for peace as well as the determination and defiance even of the children. This is what we hear little about. The Palestinians refuse to be driven out despite the pain and suffering the Gaza war still causes and the suffocating Israeli blockade which continues. “Ahmed and Ansari contrast the welcome and generosity of Palestinians despite their impoverishment, with the rough uncaring treatment they received from officialdom in Egypt . The armed police were reluctant to let them cross into Gaza and inspired fear even when the two men were on their way home to Britain. “People here desperately need to know more: how are families and communities organising daily survival? Since the Israelis want to drive the Palestinians out of Palestine , survival is central to resistance, and we know women are the first to do this work. “The report tells us that Gazans were greatly encouraged with the demonstrations in their support around the world, but they made clear that for them the greatest support now begins with boycotting Israel .